Sunday morning, 7:00am. The alarm goes off but it’s still dark outside. The pigs are quiet. So are the chickens, mostly. So I hit snooze. I’m up a little before 8, which is nice–I’ve really slept in. I look out the bedroom window, looking at the new snow on the ground. And I start counting legs. Some of our goats can be seen from the bedroom window. But it seems like something is wrong because there are too many legs. The boy looks good, a tail wagger with the cutest voice. On December 27th, I asked a goat group on Facebook about when my girl would be due. I had noticed that her udder was getting big (bagging up). They told me I had about 6 weeks. This made me happy. It’s cold right now. One of our frost-free spigots froze yesterday. I was happy to hear that she probably wouldn’t deliver until February. Ugh. Greta wasn’t nursing. We took the buckling in and toweled him off. We tried to give him milk but our calf bottle was a bit much for him. Dried off and warm, we figured we’d give him another shot with mama. It looks like he’s nursed a bit. We’ll keep an eye on him and see if Greta delivers another. You may have grown up thinking that boy goats are “billies” and girls are “nannies”. Those aren’t the words used in the world of goats. Bucks and does (pronounced dough) are grown goats and bucklings and doelings are the young. That’s all for now. More cute pics will follow. 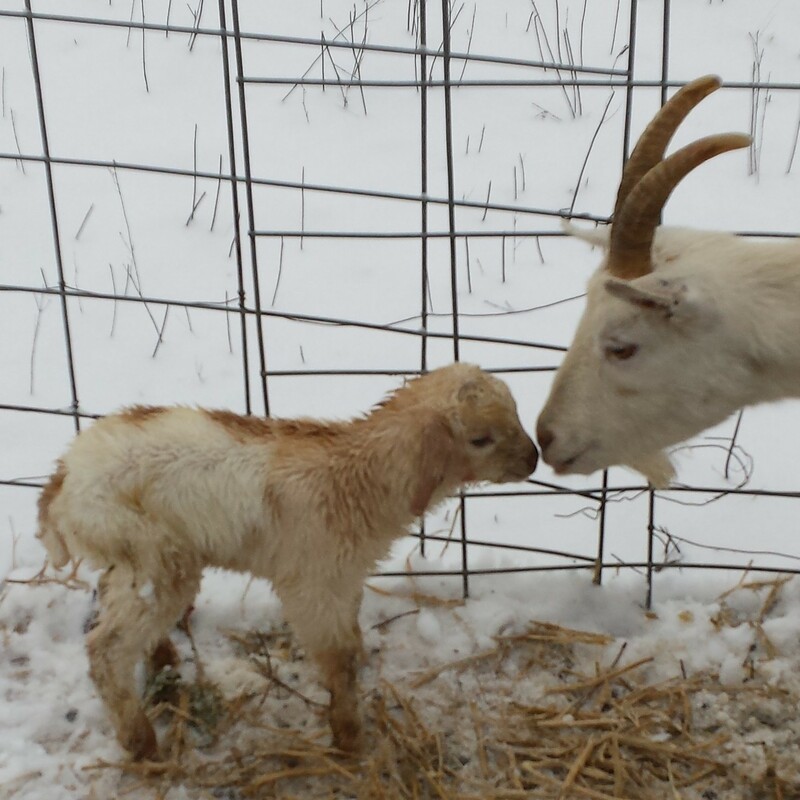 This entry was posted in Livestock, Poultry and Creatures Tame and Wild and tagged buck, buckling, goat, kid by admin. Bookmark the permalink. A wonderful photo. Cute little guy. Congrats on the new addition to the homestead! Cute baby boy! Noted the snow you have. Keep it there, OK? So sweet .. a New Year’s baby!